The law only applies to carryout bags, not to bags without handles that are used to protect merchandise, produce or meat. 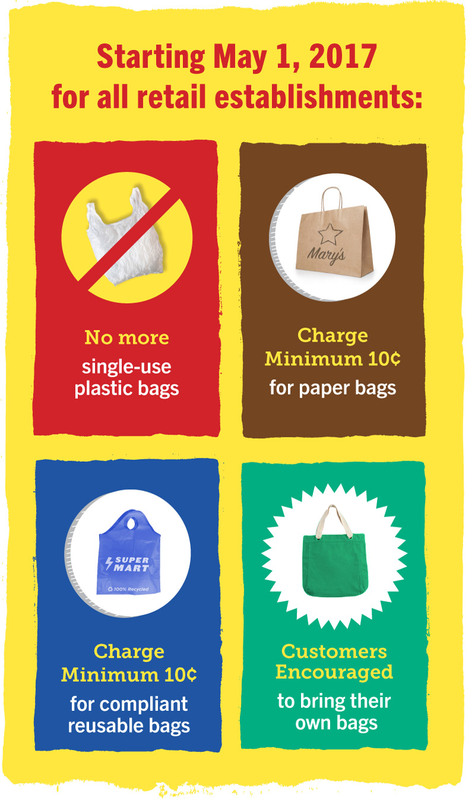 The store keeps the bag charge to offset the cost of implementing the law. The charge is not subject to tax per the California State Board of Equalization. Drug, liquor and grocery stores have been under this requirement since January 2013 and will continue to be part of the expanded law. Requirements from the recently passed Proposition 67 (CA statewide bag law) will not affect Alameda County stores. Stores that fail to comply with any elements of the law are subject to fines ranging from $100 to $1,000 depending on the nature and severity of the violation. Restaurants and eating establishments are included in the law as of November 1, 2017. Please do not throw your old bags in the trash, they can still be put to good use. Charitable reusers such as food banks are exempt from the law and are allowed to distribute single-use plastic bags. Contact the Alameda County Community Food Bank at (510) 635-3663 to donate your old bags. Charitable Thrift Stores with non-profit status are not affected by the ordinance and may distribute donated non-compliant bags at check out for no cost. If your store does not distribute bags for purchases, no changes are needed. Additionally, if your store is not a 'brick & mortar' store (e.g. Flea & Farmer's market stalls), no changes are needed. View additional information for retailers here.